Phantoms could be without defenceman Scott Robson for another month. The former Great Britain Under 18 and Under 20 international suffered concussion when on the receiving end of a hit from Sheffield Steeldogs forward Ashley Calvert on January 8. 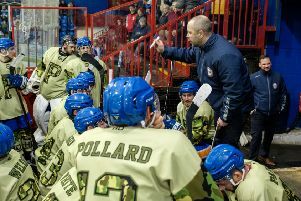 Coach Slava Koulikov is adamant Robson won’t be rushed back into action – and the same applies for another defenceman, Ben Russell, who has had a couple of spells out with concussion of late. Koulikov said: “It is not the first time that Robbo has suffered a concussion and we need to make sure he is 100 per-cent right before he returns. “I would not be surprised if we don’t see him during February. Forward Marc Levers continues his rehabilitation following hernia surgery while Will Weldon’s game-time is being carefully managed until the full extent of his knee problem is known. Phantoms were also without ill import Petr Stepanek last weekend and are monitoring his condition.